Home » My Dad - Ed Farrar » WWII » Eighth Air Force » 384th Bomb Group » 384th BG Missions » #201, 9/28/1944 » Propwash? I recently found a handwritten report from the September 28, 1944 Mission 201 that I had not seen before. It was written by co-pilot Ronald H. Froebel. He was on the crew flying lead that day, which put him in the tail gunner position, presumably for observation purposes. I am told that this was a common practice – placing a co-pilot in the tail gunner position – on lead crews. The crew that day was made up of Commander Horace E. Frink, pilot L.K. Davis, Jr., three navigators, a bombardier, a radio operator, an engineer/top turret gunner, a waist gunner, and Froebel. No. 3 ship in the High Element (Green) was almost constantly lagging behind his respective position in the formation. No. 4 in Low Element flew a good lead most of the time but flew his position lower than he should have. Two ships in the high group, Brodie & Buslee, which were involved in the collision appeared to have been caught in prop wash on a turn to the left. It appeared that Brodie was thrown down and into Buslee one plane, immediately disintegrated and the [other] broke into at the ball turret and finally caught fire and broke up. I observed one chute. On the whole the formation looked fairly decent throughout the trip until we were hit and had to leave the formation. Screaming Eagle, with Ronald H. Froebel and the Frink crew on board, was hit by flak. The ship was damaged seriously enough to necessitate landing away in Brussels. Froebel’s report is the only explanation I have read that points to prop wash as a factor in the mid-air collision. Lead Banana is the plane that broke in half at the ball turret. My father, George Edwin Farrar was just behind the ball turret in the waist gunner position. He was knocked unconscious and must have fallen through the break in the fuselage. He was fortunate to come to at 5,000 feet, in time to pull the D-ring on his chute before losing consciousness again. Below is a document from September 28, 1944 showing the 41st “C” Combat Wing. 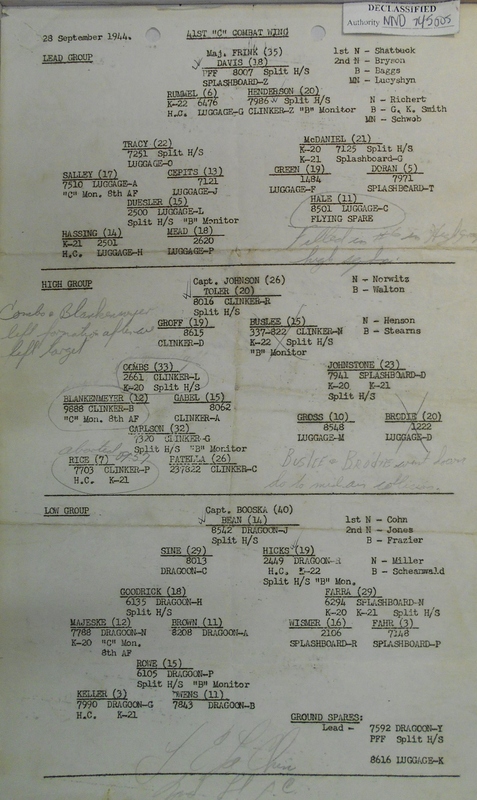 The document illustrates where all the crews should have been in the formation. The Buslee and Brodie crews are in the High Group. By thearrowheadclub in #201, 9/28/1944 on November 5, 2014 .